the diversity and character of its buildings. Tenby is situated on a peninsula, enabling it to be defended by the building of a town wall. The wall was erected in the late 13th century after the storming of the town in 1260 by Llywelyn ap Gruffudd in protest against the English occupation of Wales. 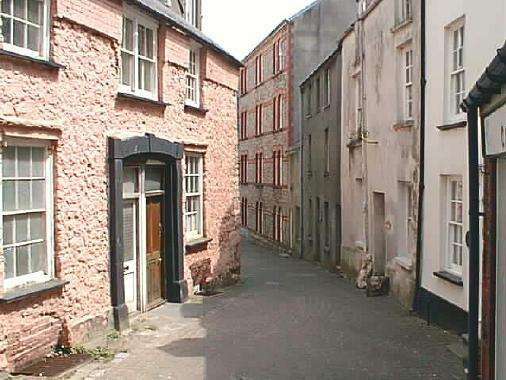 In the picture below, the old town of Tenby lies behind the wall on the right of the roadway. 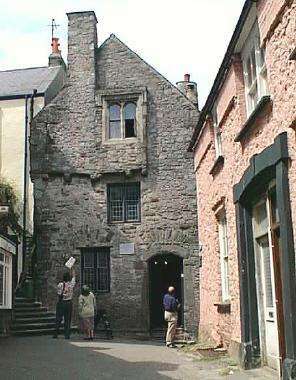 Above: Quay Hill, one of the many narrow medieval lanes in old Tenby. Halfway down Quay Hill is a fine example of a late 15th century house (above right) which originally belonged to a merchant in Tudor times. The property is owned by the National Trust organisation and is open to the public. It has been restored and furnished to re-create the atmosphere from the time when a Tudor family lived there, 500 years ago. 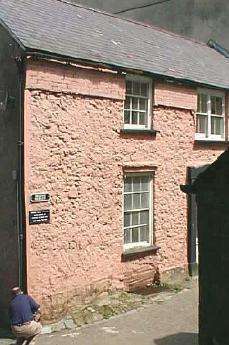 cottage, once the home of local artist and author Charles Norris (1779-1858). 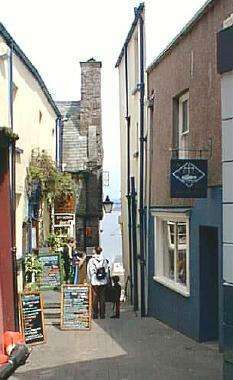 Above: Bridge Street, Tenby. 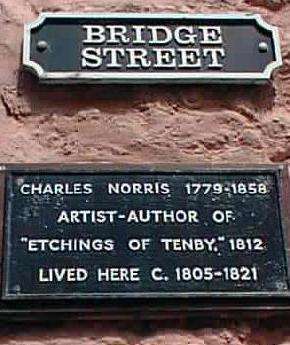 Charles Norris's house is on the immediate left. 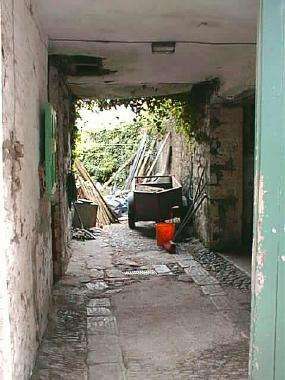 Left: An old entrance passageway leading to a sunlit and secluded yard in the centre of Tenby.